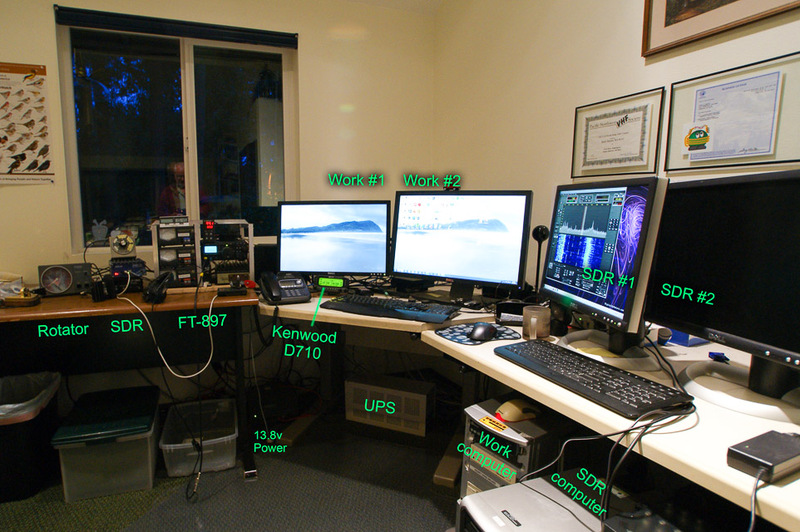 Hermes SDR is an outstanding high-performance Software Defined Radio developed by TAPR (Tucson Amateur Packet Radio) group and the Open HP SDR group. I received my Hermes card from the first production run in October 2012. This page has notes about my bring-up process and links to resources I found useful. I'm very impressed by the listening quality of this receiver. Finally, at last, I get the type of reception I've always wanted. Everything about this SDR exceeds my expectations so far. Including the learning curve of the PowerSDR user interface, lol. I'm starting with a Dell 9100 computer. Pentium-4 at 3 GHz with 1 GB of RAM. It's dedicated to SDR with nothing else but a fresh install of 64-bit Windows-7. Not sure yet if it’s sufficient for this task. It works okay so far but it' was built in 2005. I will be exploring what situations overload the CPU. Seems to be running at 60 to 80% utilization so far. In all likelihood the PC will need replacing, but the machine was available on short notice and I'm interested to see how well it works. I’m a big subscriber to the problem-solving approach of starting with the simplest possible thing that could possibly work, and gain experience to make knowledgeable decisions for improvement. 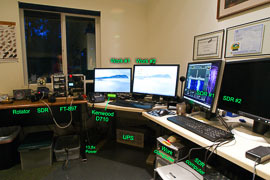 A NASA control station would be fun, I've always wanted one. But NASA does it the stupid way, with consoles arranged in long horizontal rows. They really should be stacking them vertically for more efficient use of space. Think how simple it would be for the boss to pass down instructions from his desk at the highest point in a ballistic communications protocol. Isn't it strange how they never asked me personally for my fabulous ideas on this. 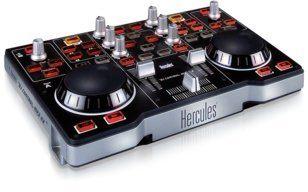 Insert setup CD and choose "Install DJ Control MP3 e2 Drivers." From the Start menu, run "Guillemot WebUpdater" to install the latest software. This software runs from a forked version of PowerSDR identified as "PowerSDR-UI". This is manually installed by copying distribution files into an installed FlexRadio PowerSDR folder. The versions must match. Check version of base PowerSDR by examining file properties of c:\Program Files\OpenHPSDR\PowerSDR (W5WC)\OpenHPSDR.exe". Use the Details tab to find Product version e.g. 2.2.3.19. Test it for basic operation. Unzip the content of PowerSDR-UI (six files) into the PowerSDR application directory, e.g., "c:\Program Files\OpenHPSDR\PowerSDR (W5WC)"
I'm finishing initial bring-up of Hermes + Anan-10 package. I installed Win-7 Ultimate on the Dell 9100. Visit openhpsdr.org/download.php and install "PowerSDR v2.2.5.0 (W5WC) Setup" in place of 2.2.3.19. The new version came up fine on receiver. But still shows Hermes firmware version 1.8. So, how to update firmware for Hermes SDR? Download the latest Windows firmware installer from http://openhpsdr.org/download.php, currently named "HPSDRProgrammer-v1.6-win32.zip"
The firmware installer is just a zip file. Unpack it and run its executable. If you are missing 'wpcap.dll' (Windows packet capture library) then download it from http://www.winpcap.org/install/default.htm currently v4.1.2. Things work great with Hermes alone! Now to connect Anan-10 and try the same receiver test again. It works great. This rig is a joy to use, and very quiet. I installed a new Dell T110 computer running Windows Server 2012 Essentials, on Intel E3-1230 V2 with 8 GB of RAM. Visit www.winpcap.org, a network packet capture program, and install WinPcap 4.1.3, which also supports Windows 8 and Windows Server 2012.
latest Windows firmware installer, currently named "HPSDRProgrammer_V2 Windows installer Version 2.0.3 -- 2013-2-16"
"PowerSDR RX2 v2.2.14.0 (W5WC) Setup"
It's time to update my firmware and software. On Windows Server 2008r2, the skins are installed to the wrong directory. Open your Windows Control Panel and uninstall "HPSDRProgrammer_V2 version 2.0.0"
Browse to RBF file recently downloaded above "Hermes_v2.4.rbf"
Don't need to uninstall the old software; it will upgrade in place. Download the latest version of fldigi from the fldigi download page. My versions are Fldigi 3.21.65 and Flarq 4.3.4. Install at least two sets of null modem emulator ports (COM5 and 15, COM6 and 16) from com0com. This is a kernel-mode virtual serial port driver for Windows. My version is 3.0.0.0 on 2013-01-08. The ReadMe instructions say to run 'bcdedit.exe -set TESTSIGNING ON' but it produced "The boot configuration data store could not be opened. Access is denied." The serial driver will create two port pairs. One is "Virtual Port Pair 0" with CNCA0 and CNCB0 ports. One is "Virtual Port Pair 1" with COM3 and COM4. Other two named "com0com - serial port emulator" on CNCAn and CNCBn ports. Download trial version from Virtual Audio Cable home page as a Zip archive. If VAC is already installed, then uninstall the old one first. Unpack the archive and run Setup. My version is 4.12.0.4973 (trial) as of 2013-01-06. Modify the two VAC connections per FlexRadio instructions above. The trial version is not usable on the air. Cost is US$35. Purchase from Muzychenko. Download the latest version from MM Hamsoft page. My version is 1.68a as of 2013-01-06. It's time to again update my firmware and software. Visit apache-labs.com, navigate to "ANAN-10 HF + 6M 10W All Mode Transceiver"
Run program "HPSDRProgrammer V2 nopcap 2.0"
Browse to RBF file recently downloaded above "1022_Hermes.rbf"